Daphnia culture is considered a black art by some who have tried unsuccessfully to raise them. For those that do manage to raise them, the benefits of feeding a natural live food to their fish can't be overemphasized. Daphnia have many advantages as a food for Goldfish. Apart from being a natural live food, they have a slight laxative effect so are an ideal supplement if dry food is being fed. As a conditioning food for breeders, they can’t be beaten. So why can some enthusiasts maintain a thriving colony while others consistently fail? For daphnia to thrive, they must be given the same water conditions your Goldfish need. Although their food sources are bacteria and suspended phytoplankton (green water), too much of either will cause the colony to fail. I have found as water conditions deteriorate, daphnia numbers drop to a level that the conditions can sustain. 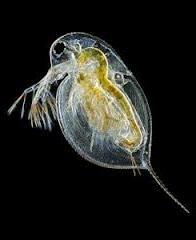 If water conditions get too bad, usually caused by overfeeding, the daphnia colony will die off. Regular water changes are required to maintain a pH level of around 7.0, bearing in mind that daphnia will not tolerate any level of chlorine in their water. Water used for water changes must be aged or a water conditioner such as Stress Coat used. When in full production, at least two 25% water changes a week are needed to keep the water in good condition. More frequent or larger water changes will increase the numbers of daphnia produced. Daphnia colonies need feeding daily in the warmer weather. The water should be crystal clear by the next feeding. If it is cloudy you are overfeeding. It is best to underfeed, and then slowly increase the feeding as the colony numbers grow. The biggest problem is judging how much to feed when colonies are very small. For this reason I always start a new colony on light green water. By the time the water starts to clear, and the colony needs feeding, there are enough daphnia present to be able to test feeding levels. Daphnia are filter feeders, straining the water through holes in their thoracic legs (swimming and feeding limbs) as they move through the water. Apart from green water, a large proportion of most other foods will sink to the bottom before it can be eaten. This is unavoidable. If this uneaten food is left to build up, water conditions will deteriorate. 2. Use scavengers such as snails or tubifex worms to eat the uneaten food. A thriving colony should have a mix of young nauplii, half grown adults and large adults. Unless the colony is new, a large number of young indicates you are over-harvesting. Very few young indicates the colony is in trouble and has stopped producing young. Immediate action is required before the colony collapses, usually water changes are required. I was testing to determine if daphnia could be used to control green water in my ponds instead of using UV clarifiers. The daphnia were placed in filter baskets that allowed the green water in but retained even the smallest daphnia nauplii. Instead of thriving, the daphnia numbers slowly declined until there were none left. I have concluded that if Goldfish are in close proximity to daphnia, the daphnia suppress producing young. Whether this is due to the growth suppressing hormone Goldfish release or some other chemical I don’t know. If someone does know I would be interested to learn why. Water changes and ensuring uneaten food is removed are the keys to a successful daphnia colony. The same level of water care is needed for daphnia as for Goldfish to keep the colony thriving and harvest-able numbers high.